Hello all. I am boarding a plane home to Toronto today where I will be spending a week going from appointment to appointment to wrap up the wedding details. Since I woke up to board the plane at an ungodly hour when some parts of the world are just starting to think of going to bed, I thought I would leave you with something sweet while I am captive in the air for eight hours. 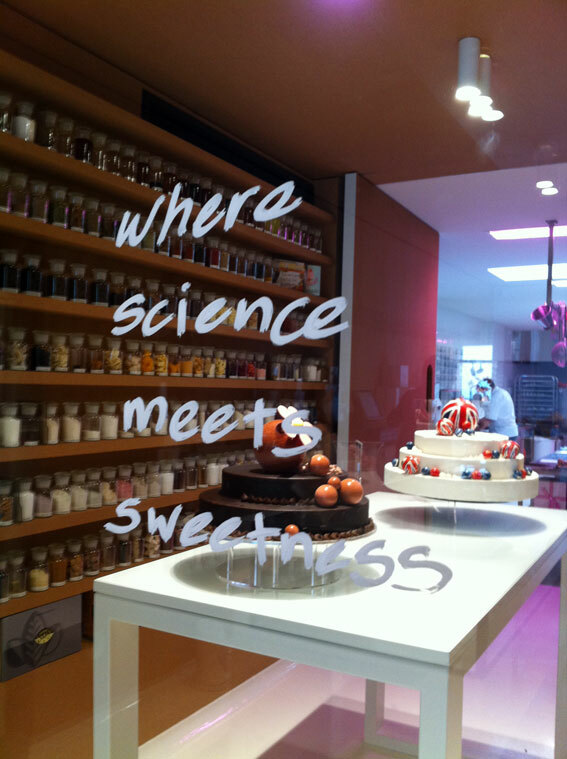 Let’s get down to business: Burch & Purchese, where science meets sweetness (the business’ tag line). What is going on with the serious baking talent coming out of Australia (Zumbo), and why didn’t someone tell me about Burch & Purchese Sweet Studio earlier? My list of reasons to travel to Australia is growing longer by the minute as I hunt the world for design inspired travel worthy blog posts to write about. These guys are another reason on my list. Burch & Purchese, started in 2011 by Ian Burch and Darren Purchese (pictured above), take sugar and butter to the next level. They are constantly on the hunt for new flavour pairing techniques and as you can see by their store interior (pictures above), their sweet laboratory would delight anyone with a serious sweet tooth who appreciates a splash of design mixed with their confections and art with their dessert. For more on what this talented duo is up to, I would recommend checking out their blog. There are three more shots I want to share with you to highlight the delectable creations of Burch & Purchese. These photos are from blogger, Off the Spork, who attended an afternoon tea event hosted by Burch & Purchese at the Langham Aria Bar in Melbourne. 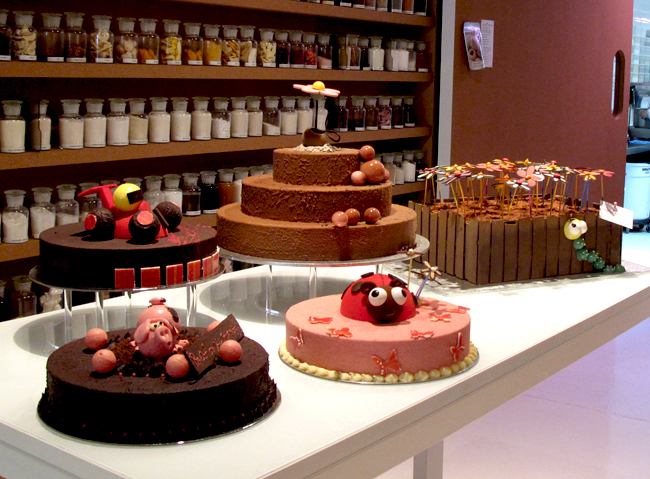 The first photo is my favourite with the mini chocolate bars towering over the banana passion fruit and white chocolate. mmmmmm. Any tea shop that sports a chandelier out of Turkish tea glasses, and has the ceiling height to do so is a tea shop I want to visit. 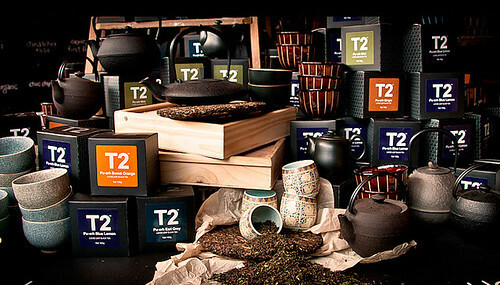 T2 or tea too, started by Maryanne Shearer in 1996 in the Fitzroy suburb in Melbourne, Australia, has done a phenomenal job filling the world with more tea, or more specifically, filling Australia with more tea. T2 currently has a network of 30 retail stores around the country and is a fabulous example of a design inspired travel destination. I love T2’s dark, modern, sleek and spacious store interior that is filled to the brim with colourful fun things to smell, see, touch and taste. 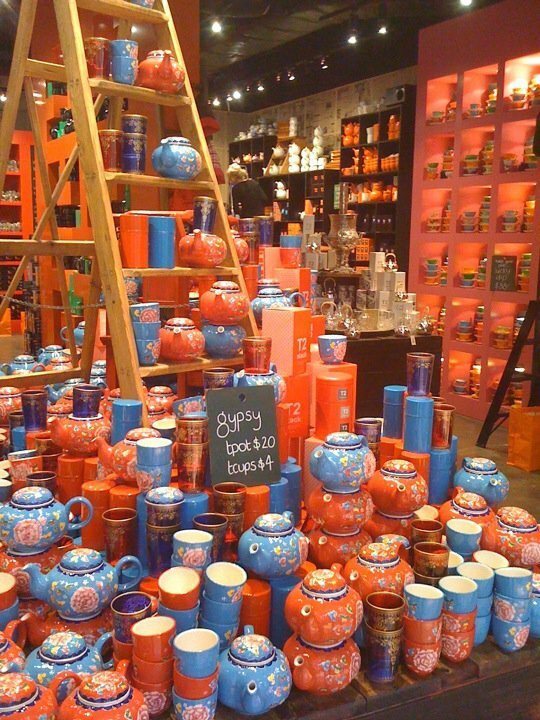 T2 carries approximately 200 teas from Asia and Europe and has a wide array of fun tea accessories from tea cups, mugs, jugs, pots, saucers and more. 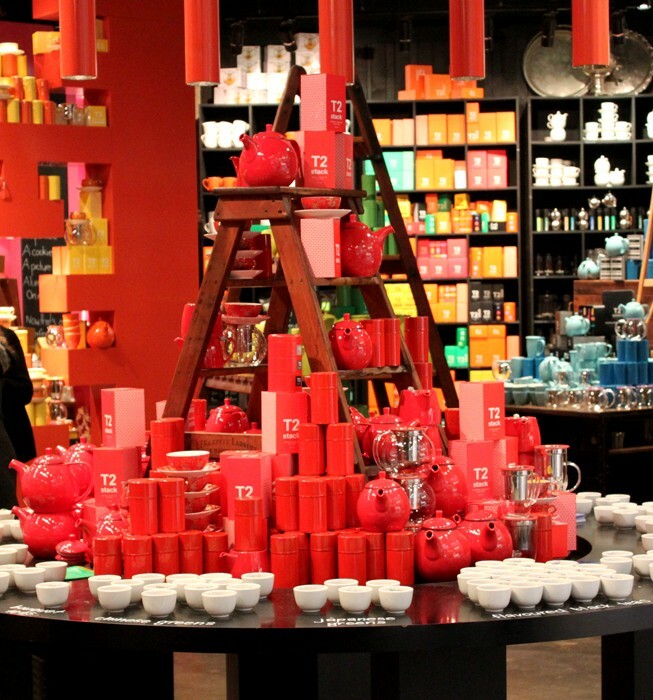 There is something very attractive about the masculine looking nature of the store interior, coupled with the brand’s bright colour palette (black, red, orange, pink) accented with Asian aesthetics and patchwork on the website-T2’s look is a stark departure from the image of a typical tea shop that one would conjure up and I think it is fabulous. I can’t wait to visit when I eventually make my way over to Australia. Has anyone visited a T2 shop before? Would love to hear about it.